MARS Brand multi-horsepower direct drive blower motors are ideal for truck stock. Four models cover both 115 volt and 208-230 volt applications from 1/6 through 3/4 HP. 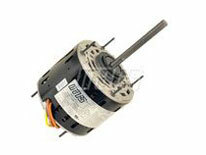 All MARS brand multi-horsepower motors feature Rheem shell mounting holes. Requires a 10/370 capacitor at 1/2 hp and a 5/370 or 7.5/370 at all other hp.